PARIS (AP) — Relishing his team’s fifth consecutive top-three finish in the French league, Monaco vice-president Vadim Vasilyev spoke in May about his dream to make Leonardo Jardim the Alex Ferguson of the principality. Less than five months later, Vasilyev and Dmitry Rybolovlev, the Russian billionaire who invested millions of euros to bring Monaco back to the topflight in 2013, have changed their mind. Following four consecutive losses that left the team in the relegation zone and in last place in its Champions League group, they dismissed the Portuguese coach on Thursday. Former Monaco player and Arsenal star Thierry Henry is reportedly in negotiations with club officials to become their new manager. Henry has been working as an assistant to Belgium coach Roberto Martinez since 2016. France’s all-time leading scorer, he played in the French league from 1994-99 with Monaco before moving to Juventus then Arsenal. A traditional powerhouse in French football, Monaco is in 18th place in the standings and winless in its past 10 games in all competitions. Jardim lasted four years in Monaco. Nothing spectacular compared to Ferguson’s 26-year tenure with the Red Devils. But during his spell, and despite Monaco’s policy to sell its best players to fill bank accounts, Jardim supervised the emergence of Kylian Mbappe as a top player, delivered a league title, led his players to the Champions League semifinals, and managed to build one of Europe’s most spectacular teams. The latest dismantling of his squad proved too much to handle, though. The combined sales of Joao Moutinho, Fabinho, and Thomas Lemar last summer dealt a fatal blow to Jardim. Monaco recruited young players, including Russia midfielder Aleksandr Golovin, but the hole left especially by Fabinho’s departure to Liverpool was not filled, leaving Monaco center backs Kamil Glick and Jemerson constantly exposed. Jardim previously dealt brilliantly with the loss of key players. Four years ago, when Monaco faced a UEFA probe for overspending on player transfers and wages, he witnessed the departures of Radamel Falcao and James Rodriguez. A year later, Anthony Martial, one of the brightest young players in French football at the time, was sold to Manchester United, after four other key players also left. Last year, he endured the sales of Mbappe, left back Benjamin Mendy, central midfielder Tiemoue Bakayoko, playmaker Bernardo Silva, forward Valere Germain, and midfielder Nabil Dirar. All of them had been instrumental in Monaco’s run to the French league trophy in 2017 when Jardim’s side won the domestic title and reached the Champions League semifinals. Deprived of its backbone, Monaco did not play the same brand of free-flowing and enthralling football as the previous season but Jardim adapted quickly to the new script and led Monaco to a runner-up finish behind Paris Saint-Germain. 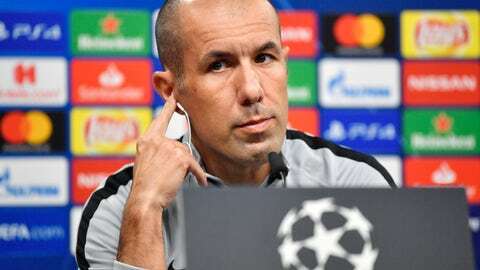 After taking over from Claudio Ranieri during the 2014 summer, the 44-year-old Jardim took some time to find the right balance, dramatically changing his tactics over the years to turn the principality side from a defensive fortress into one of Europe’s best attacking forces. A very pragmatic coach, he first focused on defensive stability to rebuild after Falcao and Rodriguez left. Falcao’s return in 2016 combined with the emergence of technically gifted players gave him the chance to implement a more offensive brand of football in a lethal 4-4-2 system that was praised across Europe for its efficiency and attacking flair. Monaco peaked last year when it ended four seasons of dominance from PSG by clinching the title in glorious style. Monaco finished eight points clear of second-place PSG and scored 107 league goals in 38 games, and more than 150 in all competitions.